Happy New Years EVE!! 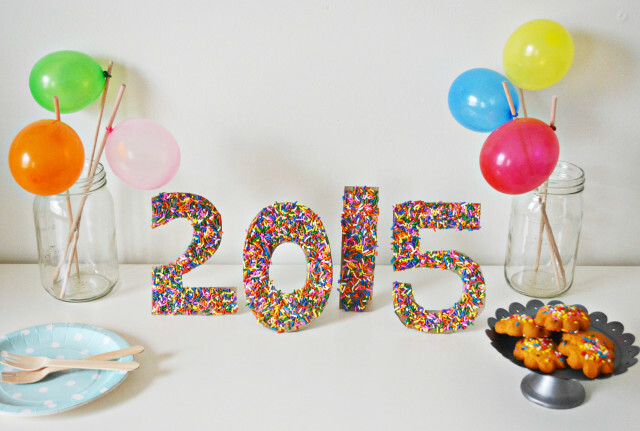 I cannot believe 2014 is over! It was such an eventful year and definitely one of the best yet! Watch out for a recap of A Joyful Riot’s highlights over this past year coming soon. For now – sprinkle numbers! 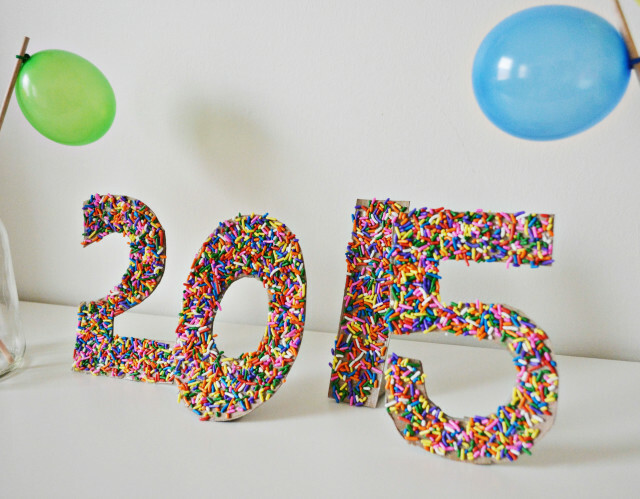 Yesterday we shared an ice cream themed NYE celebration and to go with that party post we are going to make these sprinkle numbers. 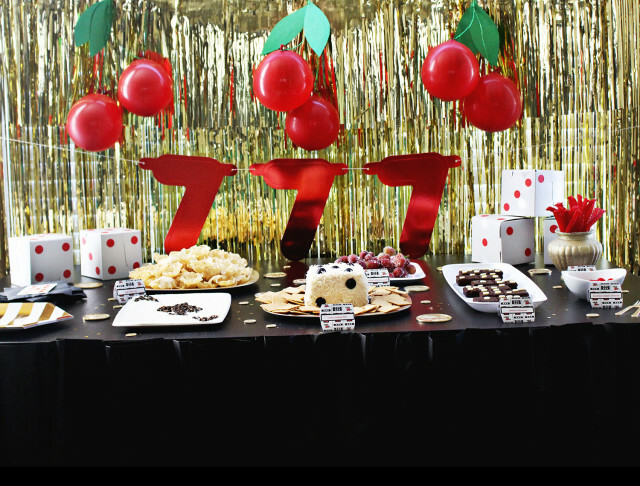 Because of course you need giant numbers to herald in the new year and what better way for these to be decorated than with sprinkles?! Pair this with ice cream cones and you’ll have a screaming fun time! New Year’s Eve parties are always full of gold and glitter and while we obviously love that with all our hearts I think there’s no reason to not incorporate more color and mix it up a bit! While thinking back on 2014, ice cream cones made a huge presence on the party/diy/craft scene and it’s easy to see why, they’re delicious AND adorable! What better way to celebrate the leaving year than to pay homage to one of it’s most popular icons? And just because those of us in the U.S. will most likely have cold outdoor temperatures for the big night does’t mean we can’t heat it up inside (ahem, dancing…) and still enjoy a cold treat. Plus all these ideas are super easy so even if you’re running a little late in preparation, there is still time for this colorful party! So bust out that pink sparkly dress instead of the typical black one and have a cheery, creamy NYE with these sweet ideas. Hello again! Malissa and I kind of took a semi-unintentional break from the blog last week so we could enjoy each other’s, and the rest of our family’s, company :) It was so nice to try and just relax and spend time together. We baked lots of treats, played games, gave gifts and even saw the new Hobbit (amazing!). We had such a nice time and now I’m trying to deal with the fact that Christmas is over..and soon 2014 will be too! It’s been such a crazy, wonderful year and my life has had many big events, one of which was my one year wedding anniversary. I knew when I was 16 that I would marry Nathanial. I obviously questioned, along with everyone else, if my 16 year old self really knew anything let alone who I’d eventually marry and there were even several years where my life went a completely different direction and I thought for sure he’d never be a part of it again. But two and a half years ago, we found each other again and things just immediately picked up where we left off! I remember about 2 months into our rekindled relationship, marriage was brought up and Nathanial said we should just do it in Vegas. I think at the time he was just thinking he needed to lock me down as quickly as possible (ha!) and I was almost offended at the thought! A vegas wedding for my party-throwing-loving self and the love of my life???! Never. For many reasons though, a little over a year later, it sounded just perfect for us. Funny how that happens. It was tacky, it was quick, it was cheap, it was personal and we loved it! 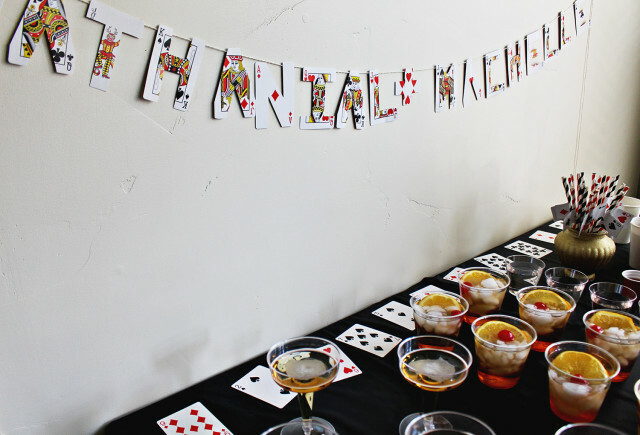 This year at the last minute we decided to have our friends over for a housewarming party and since it was on our anniversary I thought it definitely needed to be Vegas themed. 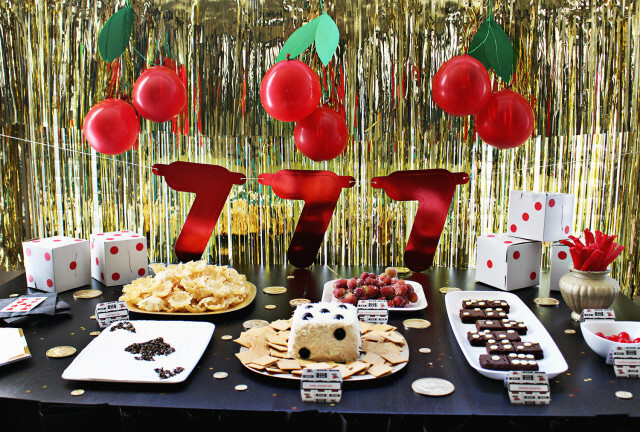 I decided to pay homage to card games and slot machines and decorated with a lot of red, black and gold and I thought sharing it this week might give you some ideas for your upcoming NYE celebrations! 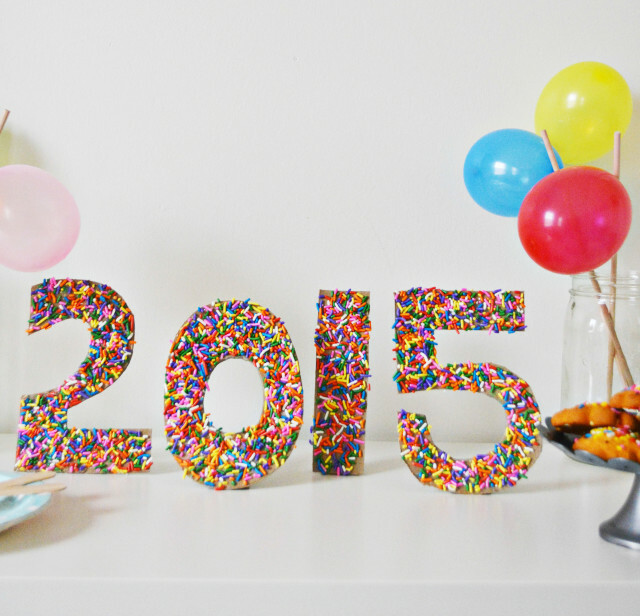 Let the glitter, games, drinks and another awesome year commence! These don’t have to be exclusive to Christmas but usually during the holiday season you have some type of pine hanging around. 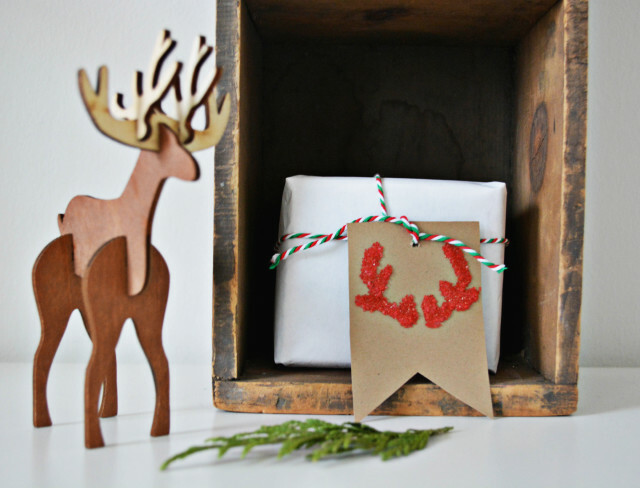 Which makes these a lot easier to make during the holidays! I would have made these with just plain twine but unfortunately I did not have any lying around so I just made do with this copper wire I had. 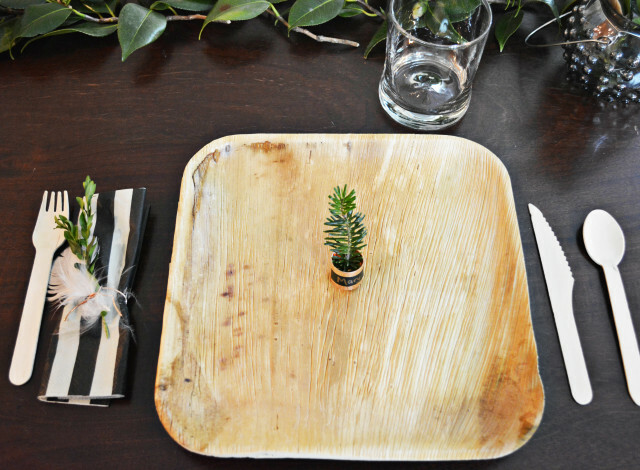 But the copper makes it pair quite nicely with the mini tree place cards. 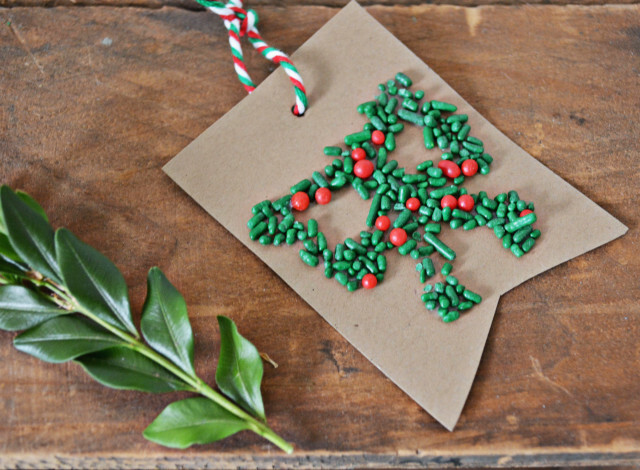 You didn’t think we’d let a holiday pass without some kind of sprinkle craft, did you? 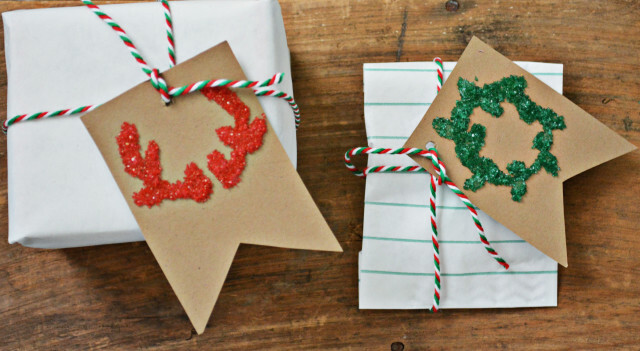 Usually you can find holiday-themed sprinkles at any grocery store and they made for perfect little gift tags. I actually have almost no gifts to wrap this year and I am a little sad. 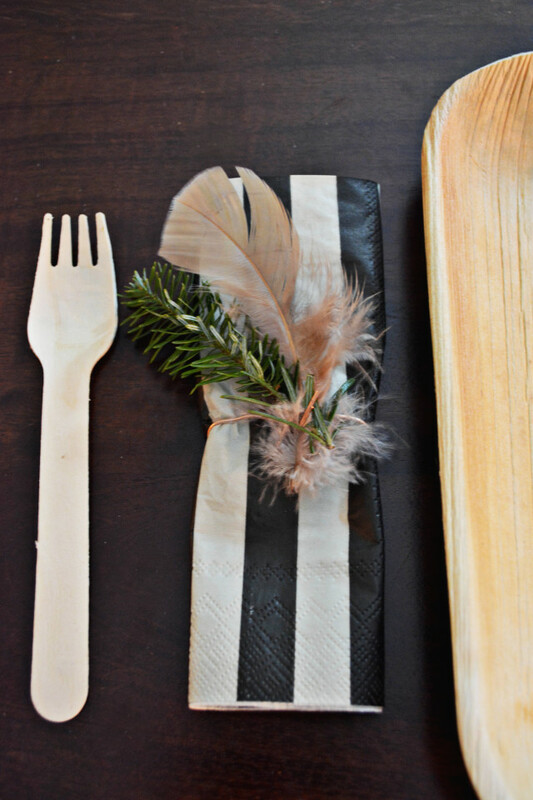 But think of how cute these would be tied around mason jars or around utensils. There are tons of fun uses!